Doug Ross @ Journal: LYIN' HILLARY: On 9/11/2012, She Told Egyptian PM the Benghazi Attack "Had Nothing to Do With the Film"
LYIN' HILLARY: On 9/11/2012, She Told Egyptian PM the Benghazi Attack "Had Nothing to Do With the Film"
Judicial Watch has obtained new documents from the Department of State containing the telephone transcripts from the evening of September 11, 2012, in which then-Secretary of State Hillary Clinton informs then-Egyptian Prime Minister Hisham Kandil that the deadly terrorist attack on the U.S. compound in Benghazi “had nothing to do with the film.” The documents include previously unreleased telephone transcripts with world leaders about the Benghazi attack. But the State Department then produced this information last month to Judicial Watch. 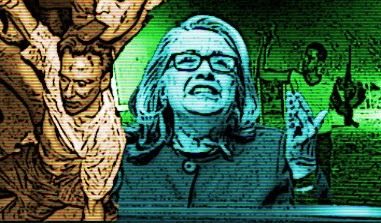 The records, the State Department told the Court, were found among thousands of new Clinton State Department records supposedly only discovered in December, 2015 – again, two months after the key Kandil document was first produced to the Benghazi Committee. In a September 12 call with the Afghan President Hamid Kharzi, Clinton says at some point they need to talk about “about religious feelings and insults and defamation.” Islamists seeks to criminalize criticism (“defamation”) of Islam. The Obama administration worked closely with advocates for restrictions on free speech as part of their Benghazi video pr campaign. And killed 4 Americans. !!! !